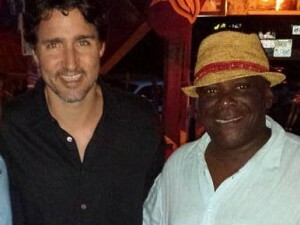 St. Kitts and Nevis Partners attend one-to-one meetings with UK Tour Operators. 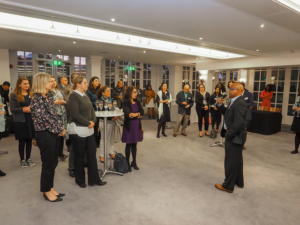 The tourism authorities of St. Kitts and Nevis together with participating partners have kicked off their 5th Destination St. Kitts and Nevis Roadshow this week in the UK, hosting up to 60 travel agents in London and Manchester. On Day One, Monday 9 October, the stunning riverside surroundings of Winchester House in London provided the backdrop for the first of the travel agent events hosting agents from major travel companies including Kuoni, Caribtours and Travel Counsellors in addition to many independent homeworkers. In Manchester on Day Two, Tuesday 10 October, agents were hosted at Hotel Football, at the unique venue of the Old Trafford Stadium with agents representing Elegant Resorts, Lusso, Trailfinders and Prestbury Travel amongst others. At the two educational networking evenings, agents were presented with the unique selling tools of the islands and participating partner information via a joint St. Kitts and Nevis presentation given by CEO Racquel Brown and CEO Greg Phillip. The agent events also marked the launch of the St. Kitts New Website and Specialist Training Programme announced during the presentation. The fun and engaging element to both events was provided by Andrew Hillier of Clear Marketing, who devised a series of quiz games to reinforce the key selling points. Winning agents were awarded top prizes including a 7-night holiday for two with YU lounge passes and a place on a Destination FAM trip as well as gift bags generously sponsored by participating partners. 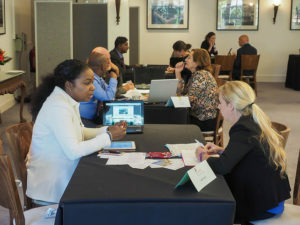 Destination Partners included St. James Travel & Tours, St. Kitts Marriott, Park Hyatt and YU Lounge from St. Kitts; and from Nevis, Nisbet Plantation Beach, Oualie Beach, Mount Nevis, Four Seasons, The Hermitage and Montpelier. The St. Kitts and Nevis Tourism Authorities wish to thank all our partners for their generous support of the agent prizes.